Rose Under Fire is the highly anticipated sequel to last year's Bulldog Reading Club selection Code Name Verity. 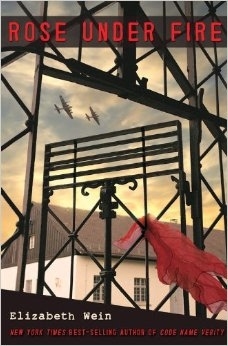 It is a historical fiction novel that takes place during World War II. A female pilot captured by Germans, Rose is sent to a concentration camp for women. Rose's horrific experiences inside this camp are based on real first person accounts of Holocaust survivors. If you enjoy historical fiction and want to read more about World War II, this would be a great selection. For more information on this book, please check out the web resources below.